From the sands of Ancient Egypt to the streets of modern Japan, the newly resurrected Great Priest Imhotep traverses time and space on the hunt for the "magai," devious beings with an appetite for destruction who impersonate the gods! When schoolgirl Hinome Hawakata crosses paths with this illustrious ancient, is her loner lifestyle about to change for the better...or for the worse? 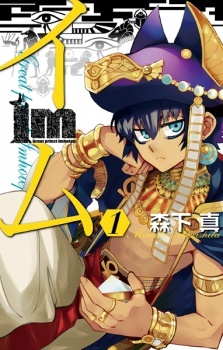 Im has been published in English as IM: The Great Priest Imhotep by Yen Press since June 27, 2017. Happy to leave a review if it gets more people to check this series out! I'm mildly obsessed with Ancient Egyptian culture, so I'm already biased in this series' favor. The fact that so many of its little details are fairly accurate to history/mythology just makes me really happy. That aside, this is a worthwhile read for any manga fan. The story's not too far yet as of the time I write this, but I'm up to date with it and I look forward to seeing how it goes from here. I think the backstory is more interesting than the story at present, but if they can fully explore everything raised there, it's gonna be one hell of an epic ride. (Chapters 6/7 explain most of this and they might be two of my favorite chapters in manga, period.) It doesn't take itself all that seriously, but it handles its serious moments well, gives them the gravity they deserve. The art and designs really stand out: the characters all have very distinctive looks, which I always appreciate, and incorporate the Ancient Egyptian aesthetic well. Shout-out to the Amen High Priest uniforms, which are absolutely awesome and tell you about the characters just from how they wear them; Anubis (who needs to exist as a plushie); and the designs of the Gods, which are every bit as impressive as you'd expect and then some. Everything's incredibly detailed and can look as energetic, elegant, or absolutely nightmarish as fits the mood. I've already screenshot a bunch of the Nightmare Fuel moments because they're bloody awesome in their gruesomeness. And the characters... Im is great, but right now the villains and gods are far and away the most interesting to me. Djoser, to be fair, is a pretty generic 'destroy the current world and remake it as I see fit' baddie, but there's nothing wrong with that if it's done well. He's got an excellent reason to feel that way, and how Im deals with him- and his own guilt over leading to this situation in the first place- could carry the series well on the merits of its premise. We haven't seen TOO much of the gods yet, but they keep a watch over everything and have already proved they're not against intervening in the mortal realm. And, I mean, THEY'RE THE FRICKING EGYPTIAN GODS; I can't wait to see how they're characterized. I will say that Hinome doesn't connect that well with the rest of the action thus far, but there's plenty of time to work her into things. Like I said, there's not tons for me to go off right now, but this is a series I'm excited to see more from and I want it to be getting all the attention it can. If you care at all about Ancient Egypt, just want to see its mythology put to better use than in the 4Kids dub of YuGiOh, or like series that dish out magic, action, mild amounts of fanservice, and badass fights against nightmarish creatures, then I especially recommend giving this one a look. I found this manga completely by chance, and was intrigued to see a manga based on Ancient Egypt (which I am absolutely fascinated by). I gave it a read, and was immediately hooked, and as I kept reading, it slowly worked its way to my personal top 5. The story in this is very good, with a well defined conflict, a well rounded setting, and a clear progression of events. The primary strength of the story lies in the way it incorporates the mythology. I mean, yeah, the characters are still drawn in the typical shounen style, and Japanese culture will inevitably trickle through and leave its integration on the Egyptian, but one kind of expects that with these kinds of stories. That all said, its in the third act that the story begins to falter slightly. As it begins to delve further in into the characters' backstories, and the story begins to have its twist, it begins to rush itself slightly. Perhaps the author had a deadline or a set amount of volumes, but a few concepts that are set up are ultimately put aside in favor of other ones. Now these new concepts aren't bad, but its not it doesn't do a story right to get rid of the old altogether. And while I won't go into spoilers in this review, I'm not fond of the ending, but I suppose that's more a matter of taste than anything else. The artwork in this is really good, and allows for a lot of creative designs and action. I really wish there was an anime of this, because I would love to see motion and color in this. I especially like the look of the gods and demons in this; while they might not be immediately recognizable (thankfully the manga always does well to identify which is which), they all have unique looks that suit their personalities and aspects. Anyone familiar with Egyptian history and culture might recognize some of the names, but they aren't the figures at all. While it uses historical names and presents them as the historical figures, they're not by any stretch of the imagination. Not a complaint or criticism, just a statement as something to keep in mind while reading. However, the strongest part of this manga's characters, is in how well defined they are. Each major character is given a clear, and well established back story, with perfectly defined motivations. Even the villains, who you presume are just there to be the one note villains so common in manga, get a full set of backstories and motivations. The relationships are also very strong and legitimate, particularly between the main characters. I do wish some characters got more attention though. The gods, for example, are indicated to have various little quirks and traits that make them unique (and some pretty cool looks), but they aren't given much time to themselves for us to learn about them. And its a shame, they could've been quite intriguing. Again, it may come down to limited time to depict all these different characters. As someone who really enjoys Ancient Egyptian history and mythology, this series is right up my personal alley. However, if you're not interested in either of those things, it might be harder to get into this manga. This series identifies as a shounen, so keep that in mind while reading, but I personally enjoyed it quite a bit, and its definitely in my personal favorites. If you're interested in Ancient Egypt, definitely give this one a look. With strong characters, a strong story, a strong setting, and some great artwork.